I drove up to the Epcot Center park gate and something seemed different. The parking lot looked worn and shabby, and a lone security guard was manning the gate. It’d been about four or five years since I’d last visited Epcot and I’d heard there was construction going on in the parks, but this stripped-down, gravelly, amusement-park look topped off by Deputy Do Right at the gate was a little too much. When the car ahead of me drove into the lot, I rolled down the window and drove up to the guard gate. I extended my hand and offered $20 to Do Right to pay the parking fee. He looked at me, puzzled. I looked at him, equally puzzled. “I’ll take your money,” Do Right said curtly, his pudgy cheeks flushed from the afternoon heat. “That’s because this is the cast member parking lot,” Do Right said somewhat irritated, and possibly debating whether he should take my $20 for wasting his time. 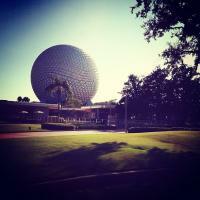 Now my cheeks flushed with embarrassment, though I marvelled at my discovery of the Epcot Center employee parking lot. I mean, who knew it was there? “Eh, GPS’ can do that,” Do Right said before giving me screwy directions that didn’t help me find the Epcot Center entrance. He let my keep my $20 and I managed to find the real Epcot Center entrance simply by following the signs—the Disney World signs, specifically. I learned the hard way that: (1) non-Disney navigational devices have no place at Disney World (it’s as if these devices are cracked and scrambled by the Mouse himself the moment you drive into the Lake Buena Vista theme park area), and (2) after four hours in the driver’s seat baking in the mid-morning and early afternoon sun on the drive north from Miami to Orlando, relinquishing all navigational control to the Disney system, or machine for that matter, wasn’t something I was ready or expecting to do on that mid-October day earlier this month. Lesson one? Learned. On to lesson two. When I finally found the right entrance gate to Epcot—it’s a long, sprawling gate, surrounded by trees at both sides, with several booths manned by not-so-happy attendants dressed in stripped yellow shirts and solid yellow shorts—I managed to find a parking space and meet up with the friend from Seattle who I had driven up to see. She had flown to Walt Disney World with a colleague to attend a work-related conference at Epcot and, now that the conference had wrapped, we were going to hang out at Epcot, have dinner at the Mexico world showcase, and enjoy the wine and food festival. The three of us—my friend, her colleague, and I—rode a few of the attractions and decided to try to have dinner at the restaurant an hour before our reservation. We were hungry and thought they might be able to squeeze us in. We didn’t realize how wrong or how misled we were. The disinterested hostess at the front, who kept playing with a pen, said we could dine earlier when we really couldn’t. After about 25 minutes of waiting, we decided to abandon our false hope of dining early and stopped by a few shops to kill time while waiting for our 7:30 p.m. reservation time. You would think that doing things the right way would have worked at Disney—an intricately-networked system that prides itself on efficiency and customer service. But it didn’t either. We wound up being seated for dinner at around 8 p.m.
By the time we left the restaurant, Illuminations—a majestic laser-light show and fireworks display that celebrates international diversity and global interconnectedness every night just before the park closes—was about 40 minutes from starting. My friend’s colleague wanted to ride Soarin’, which is a four-minute, simulated a hang glider tour of California. The wait time? More than an hour. We were in a pickle. So we stood outside the pavilion where the ride’s located debating what we should do. “Maybe they take single riders,” my friend told her colleague. “Yeah, why don’t you ask?” I told him. Suddenly, a park attendant stepped out of the shadows and said, “I’ll resolve this issue.” I don’t know who the attendant said that to, but that line wasn’t directed at us. What he did tell us was to return after Illuminations because the Soarin’ attraction would be empty by then. “I know because I have to work the ride every night,” he said with a casual, semi-sarcastic, non-Disney laugh as he walked back toward the pavilion where Soarin’ is located. We decided to walk around the world showcase and, once Illuminations ended, we were able to ride Soarin’ after a three-minute wait. How am I going to find a BP gas station and my non-Disney hotel when the stupid GPS doesn’t work properly inside the Walt Disney World theme park area? The first question still lingers in my mind. As for the second question, the fact that I’ve written this account proves that I was able to do both successfully—by following the Disney signs out of the theme park area, no less.